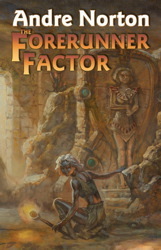 “The Forerunner Factor” is an omnibus containing “Forerunner” and “Forerunner: The Second Venture”. Andre Norton’s books talk about the Forerunners. They are those who went before and have left artefacts that noone understands. We desire what they were and had. In “Forerunner” we meet Simsa, the orphan. She lives in the Burrows, the slums in the spaceport-city on the planet Kuxortal. Her looks are exotic with iridescent blue-black skin and white hair. As many of Norton’s other protagonists, Simsa has a telepathic bond with her batlike zorsal but does not truly communicate with them. The adventure begins when she gets involved with a spaceman in search of his brother. Together they end up running for their lives. Eventually they come into contact with a Forerunner artefact and, what do you know, Simsa is revealed as one. In “Forerunner: The Second Venture” Simsa escapes captivity, crash landing on another world where life does not seem viable. She comes into intelligent life, manages to communicate with it and discovers that the Forerunners have also been there. In this novel Simsa has two goals. First and foremost she seeks to remain herself. The second is to survive without recapture.